The General Sullivan Bridge (GSB) is a 9-span steel deck and thru truss with an overall length of 1,528 feet. The bridge was completed in 1934. The deck is approximately 32 feet wide and carried vehicular traffic until 1984 when the Little Bay Bridges were completed. Since then, the GSB has been a bicycle and pedestrian crossing and a location for anglers who enjoy fishing the waters below. In 2010 and 2015, fencing was installed along the deck to limit access to the middle 10 to 15 feet of the deck based on the deterioration of the bridge. Span lengths range from 102 feet near the abutment in Dover to 275 feet at the main span over the navigational channel of Little Bay. The design of the bridge includes several continuous spans and two simple spans. The GSB is supported by two reinforced concrete abutments and eight concrete piers with granite block facing and caps. The Dover approach includes a serpentine-like pedestrian bridge constructed in 2011 with a deck that varies in width from about 14 feet to 21 feet at the GSB. The Newington approach consists of an on-grade pedestrian path. The superstructure (truss, deck, and floorsystem) is in critical condition based on a bridge inspection completed in 2016. The substructure (piers and abutments) is in fair condition. The vicinity of the General Sullivan Bridge was one of the earliest water crossings in New Hampshire. Over time, and as automobile traffic increased, the roads approaching the crossing became part of the first set of State highways. 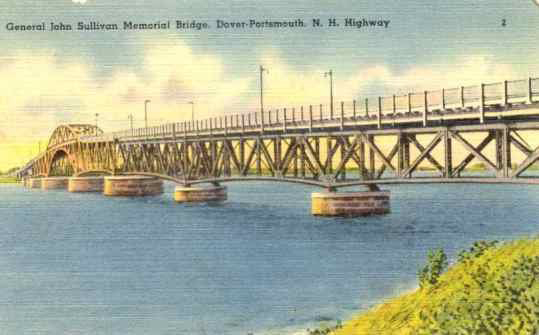 The General Sullivan Bridge carried traffic across Little Bay for more than 30 years until turnpike traffic demands required more capacity and the Little Bay Bridge was constructed and opened in 1966. The GSB continued to carry southbound traffic until 1984 when the Little Bay Bridge was widened and all turnpike traffic routed to the newer bridges. In 2015, fencing was installed along the entire GSB to restrict access to the middle of the deck based on the condition and deterioration of the truss and floor system. In 1988, the bridge was deemed eligible for National Register of Historic Places consideration. The bridge is significant at a state level based on function and connectivity of critical transportation networks in New Hampshire. Of broader significance is the fact this bridge is an early example of a continuous truss highway bridge with a unique three-span deck/thru-arch/deck continuous truss design developed by Fay, Spofford and Thorndike, one of the few nationally recognized bridge engineering firms of that time. The challenges that were overcome in the construction of the bridge itself are also significant since the bridge is subjected to some of the strongest tidal currents along the eastern seaboard of this country. The bridge exhibits much of its original construction with the exception of various deck and sidewalk repairs and the reconstruction of the abutment in Dover that was completed in 2011.